Winter still hangs on in the Northern Hemisphere, with the occasional thaw only enough to bring up the accumulated dirt and trash. In the Crimea, another democratic spring has been flipped within days into another authoritarian consolidation of power; the pattern is now all too clear, while the rapidity of the military response is becoming truly impressive. In Malaysia, a 777 has disappeared into thin air; at least the UFO hunters will be thrilled, but everyone else who flies now lives in a slightly more uncomfortable world. And if that weren’t enough disquiet, for some us the calendar has moved into Lent, a time for reflection on our many personal failings. So perhaps you can appreciate why I am grateful for this photograph. My favorite part of that caption is the word “anonymous.” Whatever else happened on February 25th, there was someone in Vancouver who wasn’t working on branding, who wasn’t worried about others free-riding, who was willing to spend time and money and effort to improve the commons, and do it without any reward, much less making a profit. Maybe it was a hedge fund manager on his day off, but I doubt it. This was done by someone who cares about art and the general welfare in equal measure, and who is able to express those commitments generously. We can call it a random act of public art. The same can be said of the photograph. “Random” may seem incorrect, for surely the photographer was acting on an intention, but the same is true of the red umbrella hangers and the other strangers signified by the allusion to “random acts of kindness.” The act is, by definition, intentional, but “random” because not directed by the usual logics of economic exchange, competitive marketing, political persuasion, or even direct social reciprocity. Yes, the photographer will have been paid for the image, but there was no guarantee of that happening, not least because there was little chance of finding hard news, or even soft news, on a beach in Vancouver in February. This image barely qualifies as news at all, although it does inform us about the public artwork on the beach. It’s something else: another work of public art, and one just about as incidental, unexpected, ephemeral, and generous as the other. And what a fine work it is. The photo is true to the work it depicts, while enhancing and extending it as well. 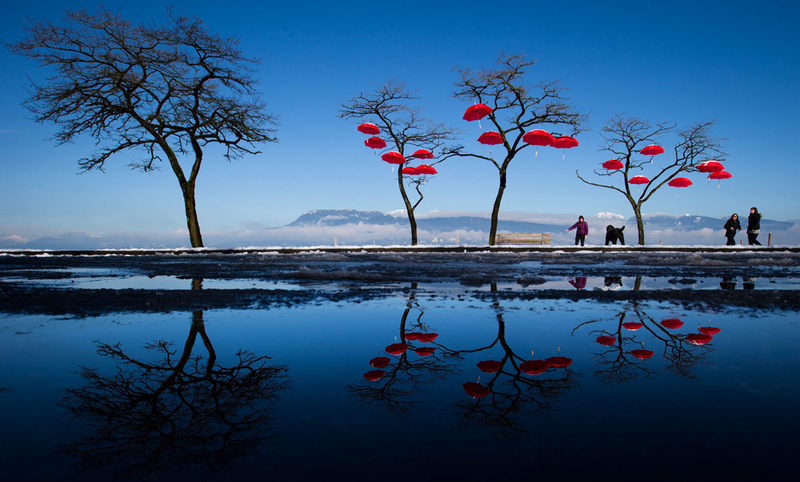 The red umbrellas hang improbably in the sky, and the trees, mountain, clouds, sky, and lake seem equally improbable and beautiful as well. That lake, itself perhaps newly freed from the ice, reflects the figures above it, just as the photograph reflects the entire tableau. Likewise, the deep blues balance the blossoms of bright red, as if they were low and high notes harmonizing. These symmetrical optics evoke a sense of serenity, but not by pretending that the scene is any more solid than it is. The reflection on the water can be broken by a single ripple, just as the scene can disappear the moment you turn away. And we all will turn away. Even those in the scene, who rightly seem to be enjoying it immensely, will walk on. The clouds will thicken, and the rain will come–remember, the umbrellas are an offering of gratitude for the rain–and the umbrellas will deteriorate or be taken down. Like the rain, this scene is not something that you can hold on to. Only the photograph will remain, albeit probably forgotten. But that’s OK, if we understand what it is teaching us today. The world is more abundant that we know. Not always, but too often the suffering that occurs is due to artificial scarcities: due to greed, hoarding, and the withholding of kindness. Any decent society ultimately depends on more than natural abundance: on commitments to the common good, the general welfare, and sharing in both hard times and good times. So it is that we ought to feel thankful for those artists and arts that are themselves acts of generosity for a public world. Next Post →What Happens When Photography Imitates Art?